The Vegan Everything: Vegan coat! Background: This (in blue) is very similar to the winter coat I got in college. I am no longer in college. It is a slightly gray color now. I wear it to work! seriously! It is time to get a new, more professional coat. I am a more professional person now, after all! The blue/grey thing may be vegan (plastic) and warm, but it is in no way stylish or professional. Enter the 2010 Vaute Couture winter coat line. Now, I had the privileged of trying on the '09 coats this past spring, but none fit me well enough to invest that kind of money. 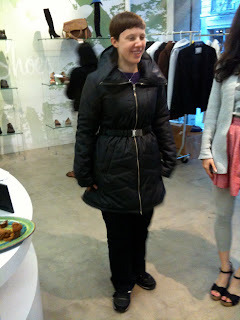 The coats were being offered half off, as it was no longer winter, but we are still talking about around $250, people! 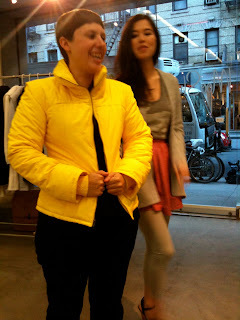 (The cost of the coats is not outrageous for what designer Leanne Mai-ly Hilgart is doing here. She is making designer coats that are vegan and fairly produced.) I wanted to love them SO badly, too! But for that kind of money, it needed to be perfect. 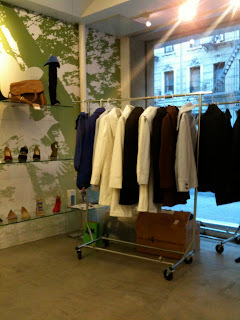 This past weekend Mooshoes, the vegan shoe store here in New York City, hosted a Vaute Couture pop-up shop! It was by appointment only, and I knew I wanted to try on the new collection and get me a vegan coat, so I made an appointment! On Tuesday armed with my gal-pal extrordinaire, Lindsay of "Kiss me, I'm vegan! ", I headed downtown for my private appointment with Leanne herself! Here are some photos (taken on my iPhone. I forgot my real camera, sorry!) of the evening! Leanne showing me how the collar of the Belden works. So many ways to work that collar! The Audrey. So elegant. An almost full length vegan coat! 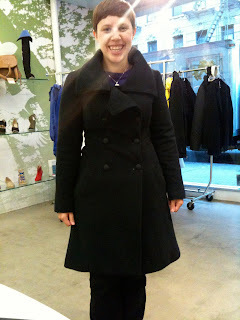 The Audrey is the coat I came in to the store thinking I'd like best. Read the rest of the post to see which one I chose! In front: Last year's collection. In back: This year's collection. The Airs. Leanne tried to convince me that I didn't look like I belonged in a rap video. She didn't win that argument. The Kinder. Such a cute coat! I was looking for something more work friendly, though. 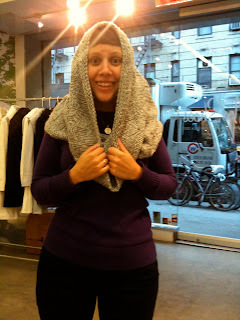 Leanna is also making soy-fiber knits! 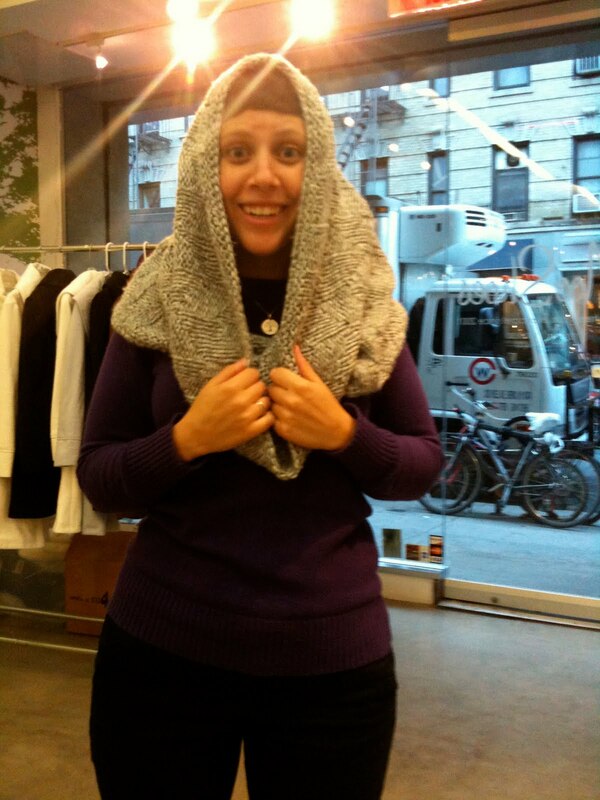 Look at this cool scarf-circle-hood-thing! And soy-fiber hats! I have a VERY small head. Which becomes even more obvious when wearing a hat like this! Look at that smiling face! It's my new coat, the Belden!! I decided on the Belden! I wasn't expecting it, but it was so flattering on me. Cinched in the waist with an A-line bottom, I look all curvy! And it is hard to see in the poor quality iPhone pictures, but this is a beautiful, well stitched, creative, professional coat! I am so looking forward to it's delivery in October. There is a sale on RIGHT NOW on Vaute Couture's website to pre-order a coat at a big discount! Leanne cannot manufacture these coats without a certain amount of pre-orders, as they are all hand made on a living wage and Leanne has no big backers. She was just a girl with a vegan dream and it is beautiful! It also needs to be said that Leanne is so friendly! She was so nice to me, letting me try every coat and put the Belden back on before making my decision. 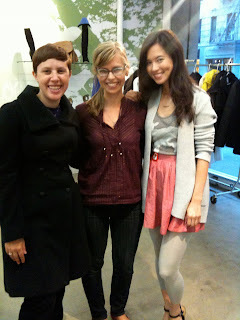 We tried on coats and talked for an hour and a half! It really was a lovely evening and event, and I got a coat out of the deal! Extra sweet! I like to think that this coat is an investment in my morals. Every step of the process in making this coat was vegan and humane. And the end result might turn a few heads! These coats are fitted to perfection. Get one for yourself! 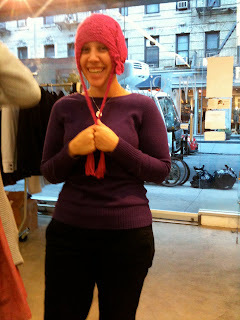 My favorite is the soy-fiber hat because you look like you're having so much fun. The Belden coat suits you perfectly :D Wowza!